One of the reasons that any person buys and recreational vehicle is so they can have freedom. They are chasing the freedom of the open road. Whether it be so that they can just go camping and fishing for a short amount of time. Or maybe they are looking to go out traveling and exploring for a longer jaunt. Then there are the ones that are just looking to pull up all roots and go out on the road and live in their recreational vehicle full time. Which ever one a person chooses it all boils down to one main thing. They are chasing the freedom of the open road. Recreational Vehicles allow a person to have their home away from home and take it with them too! They are off on an adventure and they have the treat and the pleasure of all the luxuries from home. Depending on how loaded their recreational vehicle is depends on how many luxuries from home they are traveling with. The excitement of being able to travel and see new things. Whether it be nature or even different cities and landmarks while having your home with you is just incomparable. So for anyone that has an recreational vehicle or has had one they know that Recreational Vehicles do allow you to pack a lot of living into a small space. Things might be a bit condensed in and recreational vehicle but all of that is worth it if you consider what you get in return. The ability to go where ever you want, pretty much, and see new things and meet new people. Aside from having the convenience and familiarity of your own things and surroundings recreational vehicles also help in another way. It is much cheaper to travel from place to place in your own Motorhome or recreational vehicle than it would be to travel and have to pay for hotels and motels and also pay for eating out. And the best thing about RVing is that there are so many different types of recreational vehicles out there now that anyone should be able to find a model that they can afford. Rving isn’t just for the rich. Yes you can find recreational vehicles that are a million dollars or even more, but you can find ones that are much cheaper as well. Some people are even able to make their own recreational vehicles out of campers or even old vans. Whatever is going to work for you and help you to answer the call of the open road. Life is too short and one has to get out there and enjoy it while you can. Recreational vehicles can really help a person do that. While recreational vehicles allow people to travel pretty much anywhere and have a world of fun they also have another way of enriching lives. 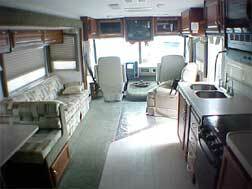 The fun and closeness that traveling in an RV can bring to friends and family cannot be beat either. With an recreational vehicle a family can have as many members (depending on the size of the recreational vehicle) as they want to all travel and have fun together. This is a priceless and important value that many people don’t think of. So for enriching your life in many ways if you can go and get yourself a recreational vehicle. They are packed with fun and can only help people to get more enjoyment out of life. Traveling while having all the comforts of home just cannot be beat. If you can have your friends and family with you as well then it really is packing a lot of living in a small space.